This is plate 44 from William Hodges' book 'Select Views in India'. 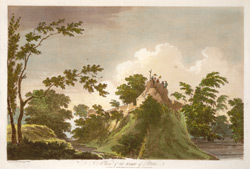 Hodges sketched the fort at Pateeta in 1781, during his stay with Governor General Warren Hastings at Chunar. The fort of Pateeta was at that time being held by the rebellious Indian ruler, Chait Singh, but British forces attacked and reclaimed the fort. Chait Singh and his armies fled west to Gwalior. Hodges described Pateeta as "a large town, surrounded by a rampart, and defended by a fort".